Camembert cheese comes from Normandie in the north of France. Normandie produces most of the cow milk. It produces lots of cream as well and most of their cuisine has fresh cream in it. Normandie is also the home of the famous Calvados an apple brandy. In local bistros patrons call it "Calva". The Camembert is one of the most well known cheeses of France and it is made of cow's milk. 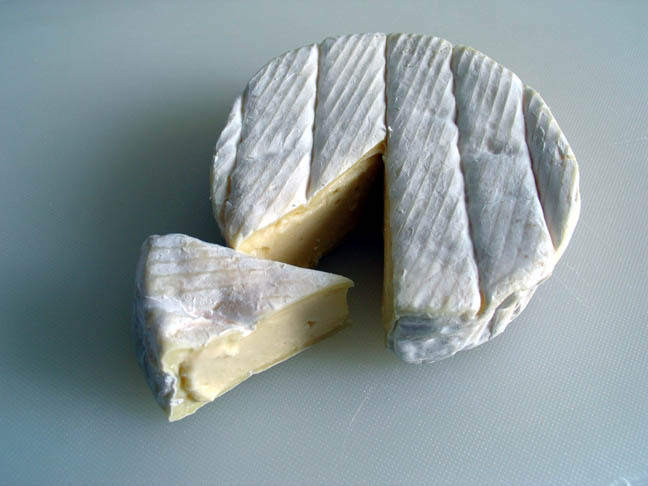 Brie is another famous cheese which is also made from cow's milk but comes from a different region of France. Some people say that France has as many cheeses as there are days in the year including leap years!! The usual way to eat camembert is fresh out of its box, with nice freshly baked bread and wine. Some people like it right out of the fridge, others like it to "mature" out of the fridge for a few hours. In other words eating cheese in France is a whole affair. Camembert Cheese has been served to me in many ways other than the usual way. I would like to share with you today a way that I just love hoping that you will like it too. - 1 Camembert medium soft in the touch when you buy it. - 2 cups corn flakes crushed with pestle and mortar into nearly a powder. - Unwrap the camembert and leave whole. - Coat all sides with the egg mixture. - Coat all sides with flour. - Coat again all sides with the egg mixture. - Then coat all sides with the crushed corn flakes. - Make sure all the camembert is coated. - Place on a heat proof plate into a preheated oven to 200 degrees Centigrade for 15 minutes or until you see traces of cheese oozing out. (My picture above shows my camembert overstayed its welcome in the oven). Serve immediately as a starter with hot freshly baked bread and a white Burgundy wine or a red Syrah.